I have had the good fortune to live in many progressive, avant garde, hippy, yuppy, far out places. And I’ve had a great sense of timing, from attending the University of Colorado at Boulder when Mork & Mindy were popular on TV in the late 1970s, to living in Upstate New York near Ithaca, the academic home of Cornell University. In the story line of Mork & Mindy, Mindy ran a retail store on the chi-chi Pearl Street Mall in the middle of Boulder, Co. I could tell my friends back home that the athletic track where Mork stood during the beginning credits was where I ran in my running class. 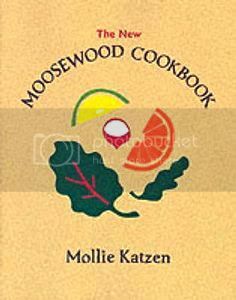 And, being in Colorado, I learned to cook out of the Moosewood Cookbook as everyone did, never dreaming that someday, when I went to graduate school, I would be in Ithaca, New York, to taste the food for myself at the Moosewood Restaurant. A pillar of vegetarian philosophy. From the Moosewood Restaurant web site: “Moosewood, Inc. is a collectively owned business with nineteen members who share responsibilities and participate in the various jobs necessary to run what has grown from a very small natural foods restaurant to become a larger and more diversified company. Most members of the Collective have worked together for at least 15 years, and some since the restaurant’s inception in 1973. The restaurant is further staffed by a talented and dedicated group of employees whom we truly appreciate and without whom we could not operate. So, being in the arts, I have traveled with trendy people, although I was more of a follower than a trend setter. Living an artsy lifestyle, I learned to do and espouse trendy things. While most of my Denver, CO friends have probably moved on to the latest current fashions, now after almost thirty five years, I am still espousing the many “fiberatorial benefits” of homemade granola. And, having made granola for as many years, I consider myself greatly accomplished. What a delight it is to make, to store and to eat. So much golden goodness at a reasonable cost, I’ve now decided to share my recipe. Organic Granola, freshly toasted from the oven. Mix dry goods with hot honey, oil and vanilla. Gently stir until evenly combined. Spread on cookie sheet with sides that has been covered with parchment paper. Toast in a 300F degree oven until golden, stirring every now and then. The times can varying greatly depending on how deep the granola is on the cookie sheet. Empty the batches in to a second big bowl. 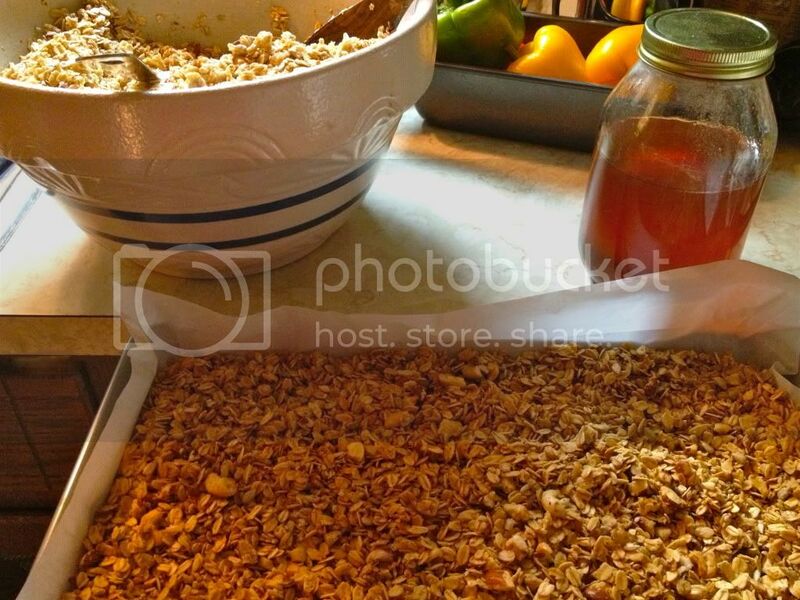 Once all the granola has been toasted, stir the different batches together in the second big bowl. Add 1 c. Organic Shredded Coconut and 1 c. Organic Raisins or Currents once the granola has cooled and stir well. Store in an airtight container. I use 1/2 gallon Mason Jars. This granola is delicious eaten with shredded Organic Apple and Raw/Real Milk.